The College of Theology and Christian Ministry (CTCM) hosted special guests this week, as members of the Mobile L’Arche community visited campus. First started by Catholic philosopher-theologian Jean Vanier in the 1960s in France, L’Arche communities provide homes and workplaces where people with and without intellectual disabilities live and work together as peers. 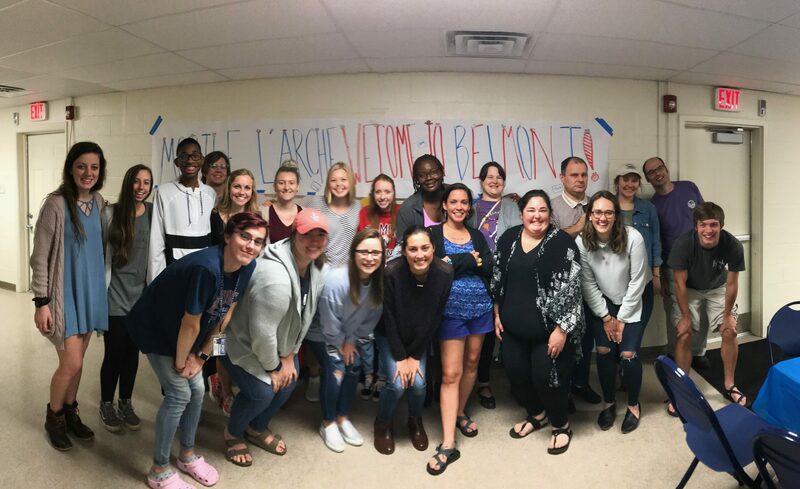 During their time on campus, L’Arche residents attended religion and social work classes, had music time with music therapy and music education students, and shared meals with students at the cafeteria and the Service House. Curtis’s students also hosted dinners for the group at the Belmont Ministry Center. CTCM students served as student buddies or ambassadors during the week to walk the visitors around campus during free time so they could experience student life, everything from music performances to the arena to the rock climbing wall.